This is the 3rd annual performance by KKSD. 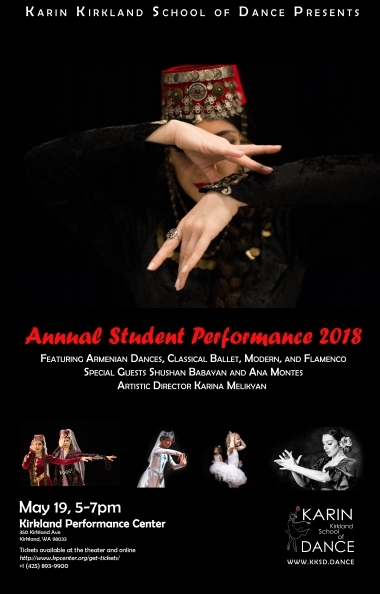 The annual performance is an opportunity for the dancers to showcase their skills as dancers and perform choreographies that they’ve been learning during the academic year. The goal of the school is to celebrate the beauty of different dance forms and interpretations, stay in touch with the origins of each dance form, respect the traditions, and pass the experience to the next generations. The inspiration for the student performance of the 2018 are two tales – “The mirror” and “Cinderella”. The Armenian dance team will perform the story “The mirror” and the ballet students will present excerpts from the ballet “Cinderella”. The second act of the show will be presented under the theme “Karina and her friends” where professional artists will perform. $25 one week before the show. Karin Kirkland School of Dance is specializing in classical ballet (Vaganova method), Armenian, and character dances. At the end of the academic year the students of KKSD go on stage showcasing the choreographies they learned during the year. Karina Melikyan – Artistic Director of KKSD. Trained in Vaganova method, former artist of ballet with the Opera and Ballet National Academic Theatre of Yerevan. Karina taught classical ballet and character dances in Armenia, Syria, and USA (Denver and Seattle). Currently teaches classical ballet/national dances and performs Armenian dances, as well as competes in Latin/Ballroom dances. Shushan Babayan – Guest performer/instructor, trained in Vaganova method, former soloist of “Barekamutyun” State Dance Ensemble of Armenia. Her breakthrough performance was in “Siretsi” (“I loved”) which became her signature performance. Currently teaches classical ballet, modern, national dances and performs in Los Angeles. Ana Montes – Guest performer/instructor, trained in Sevilla where she has studied under Angelita Vargas and Jose Galvan. Ana danced professionally at various clubs and theaters and with Rosa Montoya Bailes Flamencos, out of San Francisco. 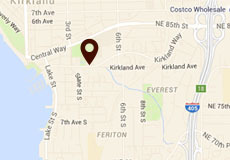 Ana has been performing and teaching in the Seattle and Bellevue areas for over a decade. Za Thomaier – Guest performer/instructor, specializing in Ballroom and Latin, west-coast, zouk and fusion dance styles. Za has been teaching for the past 5 years and competing all over the US and internationally.